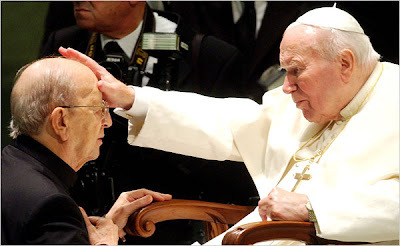 After several days of veiled hinting and internet buzz, earlier today the Legionaries of Christ confirmed unspecified revelations involving misconduct on the part of Fr Marcial Maciel Degollado, the controversial order's disgraced founder, who died at 87 a year ago last weekend. Publicly stripped of his faculties and "invited" to live a reserved life of prayer and penance by the Holy See in 2006 at the close of a years-long investigation, Maciel's twilight was clouded by scandals, most prominently involving allegations of pedophilia by a number of former Legionaries -- charges the order had protested vigorously at every turn. While the Congregation for the Doctrine of the Faith made no public judgment on the claims in announcing the arrangement and the Legion declared its founder's innocence anew at the time, the removal was largely taken as an admission of Maciel's guilt. A favorite of Pope John Paul II and many in the Roman Curia, the strictly-ordered, staunchly-conservative and highly-secretive community founded by the Mexican cleric in 1941 garnered equal amounts of praise and scorn for its rapid growth, internal cohesion and -- backed by an exceedingly loyal donor base -- its concerted entry into a host of apostolates. Considered a cult by its critics and a model by its fans, from its beginning the Legion and its lay arm Regnum Christi were heavily rooted in the charism and personality of the founder, known in life as "Padre Nuestro." Until the practice's dissolution in 2007 at the behest of Pope Benedict, even criticism of Maciel by Legionaries was banned under a secret vow made by members of the society. Last year, with the twin groups forbidden to work in a handful of US dioceses after complaints over some of their methods, Archbishop Edwin O'Brien of Baltimore made headlines after placing the Premier See's LC/RC apostolates under a notably stringent oversight. Though unconfirmed by the Legion, multiple reports indicate that the days since Friday's anniversary have seen members informed of the founder's "double life," its most widely circulated element the reported existence of at least one child born to Maciel and a mistress. In a statement earlier today, an LC spokesman said simply that "We have learned some things about our founder’s life that are surprising and difficult for us to understand. We can confirm that there are some aspects of his life that were not appropriate for a Catholic priest." In a comment at Amy Welborn's Charlotte Was Both, Tom Hoopes -- editor of the LC-owned National Catholic Register -- apologized "to the [abuse] victims, who were victims twice, the second time by calumny... to the church, which has been damaged... to those I’ve misled" for his defense of Maciel over the years. "I did it unwittingly, but this isn’t a time for excuses," Hoopes wrote. "I seek repentance and forgiveness, and I leave it at that." Maciel's successor at the Legion's helm, Fr Alvaro Corcuera del Rio, is traveling around the US to share the information with its branches. In an early January speech in Mexico, the community's general director sounded the call for a Christocentric renewal of the order. Neither Maciel's name nor the impending revelations were mentioned in the address, whose English translation was added to the Legion's website just in recent days. Operating in 22 countries, the Legion counts 800 priests and 2,500 seminarians. Regnum Christi has 70,000 members in over 40 countries worldwide.